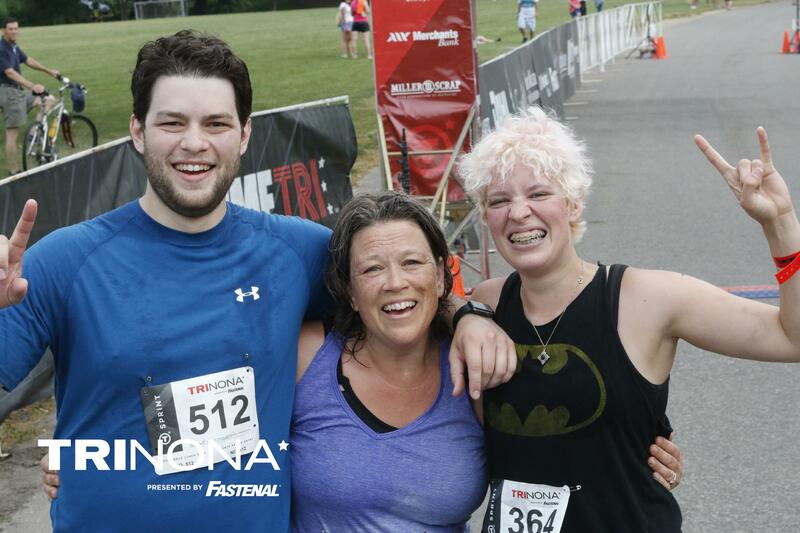 Michelle Thooft with her children Ian and Ilsa at the finish line. It was GREAT!!! Well, great considering I wasn’t going to do it three weeks ago. What you taught me on the bike was a life-saver. The hills really killed me (they were bigger than I remember lol) and there was a strong headwind, but I gave my kids a run for their money on the bike. Swim was a lot harder than I remember also– I thought I could do it this time all in a slow crawl, but I couldn’t get my breath to work with me. Not sure if I was just nervous or excited or what, but every time I put my head in the water I choked. Ended up back stroking and breast stroking the whole thing. The run was a power walk for me, and my kids (Ian 27 and Ilsa 23) just stayed with me the whole time– I kept telling them to go ahead, and they said, “No mom, we’re doing this for you. Your success is our success!” When we had about 1 1/4 miles to go, my right hamstring/glute started to ache, but we pushed on. Ilsa started singing to me (lol) the songs from my workout playlist and she and her brother were literally hopping and dancing around me, so we were a bit of a sight to be seen. Photographers liked us 🙂 I had no intention of trying to beat my best time, but I came within 6 minutes of it– and three of those minutes were me struggling to get my chain back on when I lost it. You and Phil (husband) made it look so easy! Ian finally just talked me through it and I got it. Such a bummer though, dang it. When we got to the finish, I was able to sprint it in a little– amazing how many reserves you have. My knees felt great the whole time. I stopped during the run to stretch a few times and it really helped. As soon as I was finished, I hugged my kids and hubby and parents, and promptly got ice for my knees. Iced them literally on/off all day, and rolled on the foam roller. Got a great night sleep and I feel amazing today. A little sore but not dying of ache and pain. I’m ready to get back into training…and all my kids are signing up again for next year. My coach friend thinks I should do one more this summer and then maybe the Blue Ox 5k or 10k in October. I’m thinking about it. I know I did it, but it was quite literally by the skin of my teeth, and I would like to maybe be READY for the next one, you know? Overall— I’m SO glad I did it and I’m already thinking about another! THANK YOU SO MUCH for your help!!! !